Don't have time to wash your diapers but afraid of what's taking place in your pail?...just shake a little (or a lot, diapers in, or not) and 'Breathe...again.' 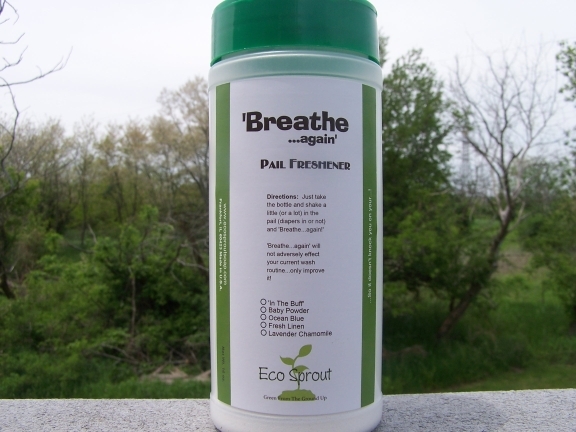 'Breathe...again' is a pail freshener designed to balance out the ph of your diaper pail. As the urea in your diapers converts to ammonia, 'Breathe...again' helps in neutralizing it naturally while leaving behind a yummy scent. 'Breathe...again' will not adversely effect your current wash routine...only improve it! A generous Net Wt. of 12oz! We finally used the last of our pail freshener after purchasing it 6 months ago. We use a little sprinkle on top of the diapers once or twice a day. It is fragrant without overpowering, and supresses the smell fairly well. Used in conjunction with our Ubbi diaper pail- our baby's nursery has no trace of diaper stink. Thanks EcoSprout! Copyright Eco Sprout. All Rights Reserved. Website design by Eco Sprout Inc. & The Pete Hulstedt Co.